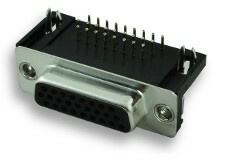 These DB26HD right angle connectors are designed to be mounted on printed circuit boards. All 26 pins and two mounting tabs (locking forks) extend through the circuit board, providing a sturdy connection. DB26HD connectors use the same shell size as DB15 connectors, but they have 3 rows of pins (High Density). These connectors are made with #4-40 threaded inserts (i.e. clinch nuts) which accept mounting hardware. The connectors can be purchased with just the threaded inserts or with jack screws pre-installed in those inserts. See the ordering table below for exact part numbers and descriptions.